Its unique hum. The menacing hue of its penetrating glow. The lightsaber. Let’s face it. You’ve always wanted one. The chance to whirl a sword of light, a sword which could cut through steel like butter. While it’s awesome to watch a Jedi Knight performing complex manouvers to take out the bad guys using on of their lightsabers, we don’t want them to have all the fun. Oh no, we want to have some of that slicing action as well. So according to the known laws of physics today, could you build your very own lightsaber? The construction of a blade of pure energy. Where to begin? The lightsaber itself is a 3 foot blade of energy which needs to be able to cut through virtually any known substance, bar another lightsaber. And last but not least, it definitely has to deflect the lasers shot from a blaster rifle! Clearly the most important part of a lightsaber is its blade. We mentioned above that it is a blade of pure energy, but we are going to have to be a little more specific. Conventional wisdom would imply that this energy would simply be a laser, and a very powerful one at that. So lets have a look at how lasers actually work. The word laser stands for light amplification by stimulated emission of radiation. Lasers make use of a subatomic process known as stimulated emission which was first postulated by Einstein in 1917. In order to understand what stimulated emissions are, we must first understand how light interacts with atoms. Consider an electron that is in orbit around a nucleus within in an atom (note that this is a highly simplified view however is sufficient for the subsequent explanation). An electron will normally occupy its lower energy or ground state within in atom. From introductory quantum mechanics we consider the orbits around the nucleus to be discrete – that is, the electron can only exist in particular orbits that are some fixed distance away from the nucleus. The further away the orbit is from the nucleus, the higher its energy state (remember that an electron likes to occupy its lowest energy state which is the orbit closest to the nucleus). However when the atom absorbs some sort of energy, for example from heat, the electron within jumps up to a larger orbit (or higher energy state). It is now said to be in its excited state. Electrons don’t tend to stay in their excited states for very long (left half of the above image), meaning shortly after jumping up they emit a photon (particle of light containing some energy) and fall back down to their original ground state. The photon the electron emits is what we see as light and is the mechanism responsible for displaying images on our televisions and providing light from our lightbulbs. In this case we have many billions of photons being emitted in random directions and with different energies (note that the energy is equivalent to the energy difference between each orbit, meaning the electrons can jump more than one orbit at a time). However for our lightsaber we require light of a single wavelength which is something which a laser produces, something which was science fiction up until the 1960’s. A laser is first set up by having a large collection of atoms in their excited states. This places the electrons in higher energy levels and ready to emit light. Stimulated emission is then used to create the beam. In stimulated emission, a photon of appropriate energy causes an excited electron to drop to its ground state, producing a second photon in the process. This second photon is said to be coherent with the first – that is, it has the same phase, frequency, polarisation, and direction of travel. If this process continues, then each photon emission stimulates some of its neighbouring electrons to emit their own photons (that are coherent). Additionally, if the photons are reflected by say two mirrors then they repeatedly traverse the same atoms, in effect amplifying the initial beam. Leaving only a small passageway for all these photons which are bouncing around inside the chamber means that we obtain a stream of intense radiation (the photons), which is of course our laser. 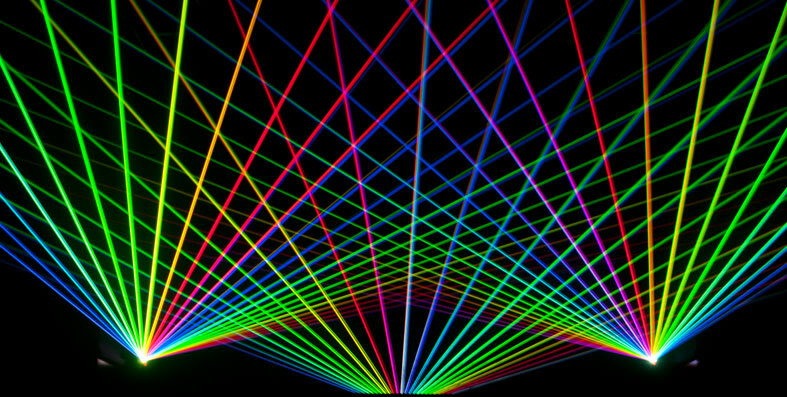 Since lasers consist of a beam of coherent source of photons, then the beam has a definite colour (controlled by the frequency of the photons). Therefore you can definitely chose the colour of your new saber (hint: violet has highest frequency, so it is the most energetic of the photons). In effect, as long as you can provide your collection of atoms with enough energy, then you will be slicing through whatsoever your heart desires! This sounds like great news. Soon you will be able to wield your very own lightsaber! Hold up – not so fast. The first criteria of a lightsaber states that the 3 foot blade of energy must cut through any substance imaginable. We have just discovered that the blade can literally be as powerful as we want it. So what’s the problem. Well, the problem is that when we turn the laser beam on we’d want it to stop after 3 feet. Instead the intense beam of radiation would be so strong that it would just continue to penetrate the air, the building, the Earth’s atmosphere and literally just keep going. If you were to face your arch nemesis and you both decided to fire up each others laser lightsabers, then instead of dodging each others strikes you would end up having to dodge the collapsing ceiling above you. This could be a problem. However a recent discovery may actually save the laser lightsaber from being written off just yet. When Albert Einstein formulated his special theory of relativity, he did so around the basis that light remained at a constant velocity of 300,000 km/s. According to Einstein, light was a massless particle which could be slowed down, reflected, passed through material, but could never be brought to an absolute halt. However recently a team led the Harvard-Smithsonian Center for Astrophysics by Ron Walsworth did just that. The Rubidium atoms are represented in red, with the passing by photons as the small yellow particles. See this video for a more detailed explanation. But unfortunately, this method fails in the last step. In order to have enough heat to cut through anything, the temperature of the blade would have to be in excess of 6,600 degrees Celsius. This would turn the rubidium gas into a superheated plasma, effectively the stuff that flows on the Sun’s surface. So yeah, it’d be hot. In addition to the light escaping as it did before, you’d effectively melt your hands off in an instant, which wouldn’t be ideal. Moreover even if you could confine the laser’s length, you wouldn’t be able to have a proper duel. While the lightsaber (laser) would still cut through things at will, when two sabers were about to collide they would simply continue to pass straight through each other. Remember, that the laser itself is simply just photons (or particles of light). Like I said, it wouldn’t make for much of a battle. This pretty much rules out the possibility of creating your very own laser lightsaber, a shame considering how cool it would be to have a real duel with your best friend (as well as losing a few limbs along the way). But all is not lost. While laser lightsabers (in the traditional sense are ruled out), Professor Michio Kaku has come up with his very own nuclear fusion fuelled design of a lightsaber. While his design is very cool, the final blueprint is far from the weapon we see the Jedi Knights and Sith duel with in the Star Wars universe. Well it seems like we’d have a better chance at travelling through hyperspace to Ilum than we would in creating a lightsaber here on Earth. – Sci Fi Science How to Build a Light Saber 1/3 – YouTube. 2015. Sci Fi Science How to Build a Light Saber 1/3 – YouTube. [ONLINE] Available at: https://www.youtube.com/watch?v=xSNubaa7n9o. [Accessed 08 December 2015]. – C Pickover, The Physics Book, Barnes & Noble, New York, 2011. – The Laser/Atom Connection – How Lasers Work. 2015. The Laser/Atom Connection – How Lasers Work. [ONLINE] Available at: http://science.howstuffworks.com/laser3.htm. [Accessed 08 December 2015]. – Lightsaber – Wookieepedia, the Star Wars Wiki – Wikia. 2015. Lightsaber – Wookieepedia, the Star Wars Wiki – Wikia. [ONLINE] Available at: http://starwars.wikia.com/wiki/Lightsaber. [Accessed 08 December 2015]. – R Eisberg, R Resnick, Quantum Physics of Atoms, Molecules, Solids, Nuclei, and Particles, Wileym 1974.